This summer, Le Boat is offering travellers a variety of options to explore the UNESCO World Heritage Rideau Canal on their private cruiser. What's more, the company is holding a special Easter sale starting April 18, 2019, offering savings of up to 30% off 2019 vacations - details below. When it comes to holidays, Le Boat’s self-cruising vacations on the Rideau Canal offer the best of all worlds – pristine natural settings perfect for relaxing, swimming and kayaking, charming small-towns and artist villages perfect for strolling, and two vibrant cities offering great food, shopping, and nightlife. Stretching 202-kilometres from Ottawa to Kingston, the Rideau Canal is a UNESCO World Heritage Site. It’s the oldest continuously-operating canal system in North America and most of its locks still operate with the same technology as when it was first opened in 1832. 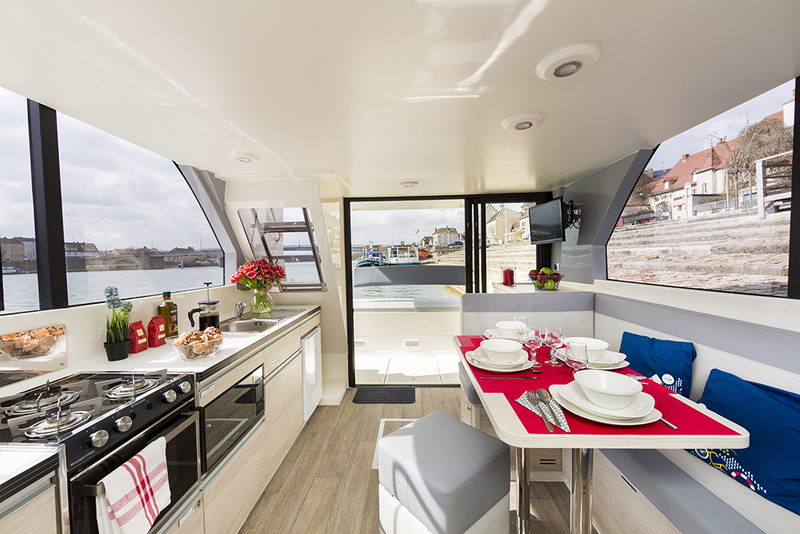 The boats are comparable to a floating cottage or condo and come with all you need: a fully equipped kitchen, linens, an en suite bathroom in every cabin, top deck and sundeck outdoor areas and BBQs. Le Boat takes care of everything. With over 42 models to choose from, Le Boat offers boats to fit all budgets, group sizes, and travel styles. What’s more, Le Boat’s cruisers are easy to drive, with no license or previous boating experience required to enjoy this holiday. As the Captain of your own Le Boat cruiser, you decide where to stop and what to see. Canal cruise vacations can be whatever you want them to be; from an action-packed adventure to a slow-paced chance to unwind. Eat, sleep, relax and bask in the summer sun, enjoy local foods, picturesque views and fun festivals along the waterway, from the vantage of your own private boat. When you cruise with Le Boat you are the captain and can set the pace as fast or as slow as you like. Stop at the docks to tour a local winery and do some sightseeing or cruise on by and drop anchor for a refreshing swim or some fishing. Extend your adventure further by adding bikes, stand up paddle boards or kayaks to your boat for more fun! relaxation. Cruise to Canada’s prettiest village, Merrickville, the perfect choice for Victoria Day. Merrickville hosts an annual Tulip Festival May 10th to 20th, so the tulips will be in full bloom. Rent a bike from Le Boat and explore the beauty of the village and countryside. Mark Canada’s birthday in a classic Canadian way, with a relaxing five days, four nights on the Rideau Canal. Travel from Smiths Falls to the heritage town of Perth and explore boutique stores, delicious edibles (including two breweries and a distillery), and a chocolaterie. Perth has an active theatre scene, so you can take in a play or outdoor live theatrical performance almost any day of the week. Celebrate Canada Day in Perth with live music and a firework display, then head back to Smiths Falls relaxed and refreshed. There are many local Canada Day’s festivals and fireworks display happening along the Rideau waterway for you to take part in, including the nation’s largest birthday party in Ottawa. You could take a longer cruise up to Canada’s capital and moor right downtown - just steps away from the celebrations on parliament hill. The weather is still beautiful on the canal in August with its warm summer days and cooler nights. Depart from either of Le Boat’s bases (Smiths Falls or Seeley’s Bay) and spend four days, three nights on a relaxing cruise featuring great wildlife viewing, sunsets and starry nights. If starting in Smiths Falls, you won’t want to miss visiting 4 Degrees Brewing in Smiths Falls to sample local craft beer with a history-themed twist. And if history is your interest, you’ll also want to take the short walk across the canal from the base to Parks Canada’s Rideau Canal Visitor Centre where you can learn about the construction of one of the greatest engineering feats in Canadian history. Or cruise from Le Boat’s base in Seeley’s Bay to beautiful Kingston and learn more about our military past at Old Fort Henry. Labour Day Weekend is known for its often perfect weather, when the Rideau Canal will be filled with boaters making the most of this long weekend at the end of summer season. Extend your weekend by a day or two and make the most of the holiday! Enjoy five nights on the Rideau Canal travelling from Le Boat’s satellite base at Seeley’s Bay to Smiths Falls, a one-way trip. This route offers 17 hours of peaceful cruising, and takes you through scenic Jones Falls, Chaffey’s Locks and Newboro lockstations and offers an opportunity to visit Westport. Explore boutique shops, restaurants, hike Foley Mountain for great lookout view, or visit a family-owned winery right in the heart of Westport, a village that’s often considered one of the cutest in Canada. Of course, if you have more time you can also book a longer break with Le Boat, and enjoy seven, 10, or 14-day holidays on the Rideau to see all the sights in one fantastic water-based adventure. Travel from Smiths Falls to the historic fort town of Kingston, or explore Canada’s capital city, Ottawa, at your leisure. Moor your boat along the canal right in downtown Ottawa and experience the city from a new perspective. 15% off Horizon 4 and Horizon 5 boat rentals on the Rideau Canal cruising June to October. For more information, visit www.leboat.com or call 1-800-734-5491.